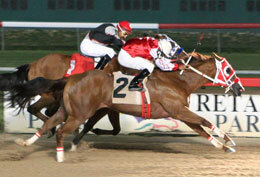 DM Red Tide, under jockey Cipriano Vidana, holds off Rush in the final Adequan Retama Park Derby trial on Friday night. SELMA, TX�JULY 26, 2013�Royal Vista Ranches, LLC's stallion battery dominated the Adequan Derby trials Friday night at Retama Park getting four finalists including the top two qualifiers. The 10 fastest challenge enrolled 3-year-olds from the three trial races will return to the central Texas racetrack on August 10 and vie for the winner's share of $25,000-added purse and the right to represent in the $200,000-Guaranteed Adequan Derby Challenge Championship(G2) at the Bank of America Challenge Championships November 9 at Los Alamitos Race Course. Juan Escalante's Dm Red Tide took big step forward Friday night as he held off Rush to set the top qualifying time . Making his first start since a 4th place effort for a $5,000 tag at Remington Park May 10, Dm Red Tide completed the 400 yard course with the fastest clocking of :20.076 seconds, a 93 speed index into the 12 mph headwind. Cipriano Vidana had the riding assignment for trainer Jorge Muniz. It was the second win for the WAVE CARVER Oklahoma bred gelding out of Sashay N Six, by Sixarun. Don Moler is the breeder. Under jockey Manuel Gutierrez' James On The Run posted the second fastest time of :20.188 seconds following a three-quarter length victory in the first trial. The IVORY JAMES gelding owned by Rancho Los Dos Potrillos, LLC was making his first start since finished third in the $208,090 South Florida Derby on February 17. Ricardo Martinez trains the Vessels Stallion Farm, LLC California-bred. He is out of the Apollo (TB) mare Habitual Dreamer. Bulletinthegun qualified with the 8th fastest time for owner Juan Migel Rodriguez. Jimmy and Elaine Coffman bred the PYC PAINT YOUR WAGON gelding in Texas from the Illegal Runaway mare Flyin Legal. Also owned by Rodriguez was 10th qualifier De Big Wave. Vaughn and Jill Cook bred the WAVE CARVER gelding in Oklahoma from the Chicks Beduino mare Royal Delphias Chick. Jacobo Mejia saddled both qualifiers who were ridden by Edgar Martinez. For the complete list of Adequan Derby Retama Park Derby qualifiers, times, sires, dams, owners, breeders, trainers and jockeys CLICK HERE.